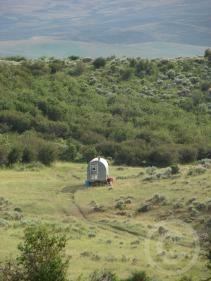 Hunting, Sheep Wagon Vacations, Working ranch tours and more! You can come stay in a sheep wagon and share a day...or two's...work like the crew from Discovery Channel's Dirty Jobs did! Whether you join us for lambing in the spring or something a little slower paced, we know you will have a great time. Don't forget about our Fall Sheep Wagon Days festival...you'll get a taste of it all and in only two days!! Plus there's a ton of great entertainment for free! This year we'll be adding a sheep trailing, something not everyone gets to see...or help with! Looking for a vacation that is WAY out of the ordinary? We have something to offer that is unlike any other! Imagine camping...in style! Although a sheep wagon is not a HUGE space, you will be amazed at how efficient and fun they can be to stay in. You can pick your site! Whether you would like to be fairly close to a road in the open sage, service berry and oak brush...less than an hours drive from our historic downtown, for shopping and site seeing...or High up in the quaking aspen with no interruptions to spoil a much needed peaceful get away! We can even arrange horses for your stay! There are many unique opportunities to an adventure like this. Wildlife viewing, hiking, fishing, nature photography or just relaxing miles away from any urban settlements! We can cater from the mildly outdoorsy to the true nature enthusiast! The options are boundless! 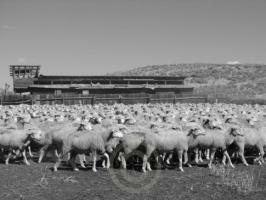 If you think this is just the vacation for you give us a buzz and we'll custom tailor your Sheep Wagon Vacation today! Working ranch tours provide a hands on outdoor experience like no other! Finding affordable family fun is getting harder to do. We have a unique opportunity to share the lifestyle and work that we love with others. Whether you have young kids that you want to share the history of the country with, or even if you are a kid at heart and want to connect with the land, we can help. Ranching offers numerous opportunities that fit into four seasons of fun and education. We start in the Spring, bringing lambs into the world and caring for the ewes. Then onto continually moving the herd to keep the pastures in the best possible condition for the Summer and Fall. Summertime opens the door to horseback riding, fencing, haying and all the other little jobs that add up to a full ranch schedule. Depending on that schedule and your preference for a laid-back vacation or one filled with hard-working fun there is sure to be something for everyone. Even those that can't keep up anymore but love to be around it all to reminisce. Fall is the perfect time to slow down and enjoy each others company camping under a beautiful canopy of everchanging color. Winter opens up the chance to see Mother Nature from a easy cross-country skiing point of view, a lazy snowmobile tour throught the frosted woods, or even a rowdy ride through the powder! Best of all...NO Black-Out dates!!! There is always something to do. We can even work it around the schedule of events going on in and around town! Call us, we will work with you to customize the perfect vacation for your family.